Can you help a growing charity strengthen how it works? People Matters is developing all the time. If you interested in joining us to deliver a service aiming for the highest reputation see our vacancies which are advertised on this page. We welcome applications from people with disabilities and we are both a Disability Confident Employer and a Mindful Employer. As part of induction all new appointments complete an occupational health questionnaire so we are best able to offer appropriate support. Easy read, braille and audio versions of application forms, job descriptions and person specifications are available on request. See below for current opportunities. Could you bring enthusiasm and join our individual support service and group activities? We want people with a commitment to supporting people with learning disabilities, autism and other disabilities/disadvantages to increase their skills, be more independent and valued members of their local communities. The organisation is CQC registered and is now starting to receive some referrals for people with more complex needs. Opportunities are currently available on a part time basis. These roles are typically around 20 hours per week upwards with overtime also frequently available. At 20hrs pw the salary is £9100 pa (FTE £18,200) with an hourly rate of £8.75 ph. For further information on these roles please see the Job Description Support Worker May 2017 and then complete a Support worker application form may 2017 The closing date for this recruitment round is Wednesay 24th April 2019 at 9.30am. Please send completed applications to info@peoplemattersleeds.co.uk . CVs are not be accepted. We are always keen to hear from support workers with the potential to be exceptional. We are a growing organisation with a strong value base and a focus on outcomes and person centredness. We offer support for accredited training from health and social care to progression into other roles and welcome applications from all sections of the community, particularly those with disabilities. If you can offer language skills such as either Punjabi or Urdu these are also welcomed. We have now transferred our DWP Two Ticks accreditation to being a level 2 Disability Confident Employer. Busy working out how to achieve the level 3 Disability Confident Leader as soon as we can. Here at People Matters we know that people with learning disabilities often want to work. Only about 7% have jobs but research says 65% want to. We have recently been awarded the DWP Two Ticks award. This means that anyone with a disability who meets the criteria will be interviewed when they apply for a job. (As well as other commitments we have made under the scheme). 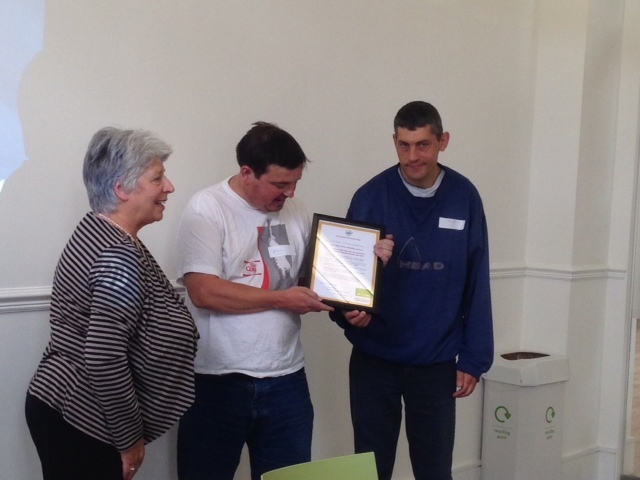 Here is a DWP Disability employment Adviser awarding us the Two ticks Award. Robert, one of our volunteer directors has talked to us about his experiences and feelings about employment too.